Be the first to share your favorite memory, photo or story of Mort . This memorial page is dedicated for family, friends and future generations to celebrate the life of their loved one. KRASNER, Mort - age 84, of Flint Twp., died Thursday, January 31, 2019. A visitation with family will be held 2-4 and 6-8 PM Monday, February 4, 2019 at Sharp Funeral Home & Cremation Center, 6063 Fenton Rd., Flint. Mort was born June 27, 1934 in Grand Rapids, MI. The family moved to Flint before his first birthday and his father established Krasner Jewelers over the Kresge Store in Downtown Flint. Mort graduated from Flint Central High School and was a proud "Indian". He graduated from the University of Michigan with a Business Administration Degree (B.A.) in 1956. Sadly his father died while Mort was in college which placed the business into Mort's hands at 22 years of age and it became his life's work from then on. He ran the business during the heyday of Flint and GM but things changed and Downtown Flint could no longer sustain the business so the store moved to Miller Road in Flint Twp. in 1978 and finally closed in 2003 after 68 years. Mort was a bachelor for 40 years when he met a Brit named Judy. They were married in 1976 and together they operated the business for its last 27 years. As a graduate of U of M, he bled Maize and Blue, was a lifetime alumni, football games and tailgating for 31 years and a member of the M Club of Flint. He attended the Indy 500 race for 31 years with seats on the Start/Finish line. Almost 40 years of season tickets to the Flint Symphony. He loved golf, enjoyed bowling and sponsored several men's and women's teams for many years. Mort met Judy as a bowler and "since I couldn't beat her, I married her". In his retirement he started baking and was really good at cakes and cookies much to the delight of his grandchildren. Mort was always willing to help, "No" was not in his vocabulary. 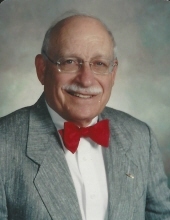 He was a lifetime member of Temple Beth El, on the Board, the Endowment Committee and Treasurer for 10 years. He served on the Jewish Federation Board, was a member and treasurer of the Retired Men's Federation of Greater Flint (RMFGF), was on the Financial Advisory Board of Flint Public Library, Publicity Chair and Scholarship Committee member of West Flint Business Association, served on the original Central Business District Authority (CBDA) Board of Flint Twp. and was integral in the fight to get a Post Office in Flint Twp. when things floundered he made a contact with Senator Debbie Stabenow and together they pushed hard to get it done. Mort was a member of the Shakespeare Club of Flint, Masonic Lodge #147, the Shrine and Consistory. As a young man, he was State Treasurer of the Junior Chamber of Commerce and volunteered with the Old News Boys. A lifetime member of the Gemological Institute of America (GIA) and an accredited gemologist and appraiser. He was a diamond setter and bench jeweler which is why he always wore a bow tie, having learned while young that a long tie and an open flame can be a "disaster". He had over 130 bow ties at last count. Family was a great joy, watching his children grow, their successes were his successes. The fact that he was 80 years old when his first grandchild was born made his life complete. Surviving are: wife of 42 years, Judy; daughter, Deborah Krasner of Ypsilanti; son, Benjamin and wife, Natalie and the loves of his life, granddaughters, Annabelle and Madelyn of Maumee, OH; cousins, Jack Krasner and wife, Beverley of Winamac, IN, Lee Zendel and wife, Ruth of Rochester, MI and their families; nieces Lori Feldheim, Deborah Feldheim-Levine and Barbara Feldheim-Squiller. Mort was preceded in death by his parents, Benjamin and Miriam "Mary" Krasner and his sister, Myra Feldheim. Grateful thanks to Mort's caregivers on his difficult 3 year journey. To his doctor and friend, Eugene Chardoul, M.D., to the doctors, surgeons and nurses at U of M Hospital, Ann Arbor at the Cancer Center, Cardiovascular Unit, Radiation Oncology Department and Oncology Pain Management. Special thanks for the gentle and thoughtful care by the nurses and aides at Caretel Inns of Linden and the Residential Hospice nurses who came there to ease his final journey. In lieu of flowers, donations may be made to Temple Beth El, West Flint Business Association Scholarship Fund, Flint Symphony or a charity of one's choice. Tributes may be shared at www.sharpfuneralhomes.com. To send flowers or a remembrance gift to the family of Mort Krasner, please visit our Tribute Store. "Email Address" would like to share the life celebration of Mort Krasner. Click on the "link" to go to share a favorite memory or leave a condolence message for the family.